I confess that I really like cut-up music (using bits of other peoples recordings to make something new, just like collage), and I don't think the much debated plagiarism concern is at all relevant. Borrowing musical ideas has been going on forever and, since the fact that the world-famous riff to Deep Purple's 'Smoke on the Water' is supposedly the opening to Beethoven's Fifth played backwards (according to Richie Blackmore, who wrote it) doesn't seem to have caused an outcry, the ethics of the practice of cut-up are, to my mind, not in question. What is in question is whether the outcome is any good or not and by that I guess I mean is the whole better than the sum of the parts and does the cut-up artist have something original to say that's worth saying? Otherwise the result is just a complicated version of a Spotify playlist. 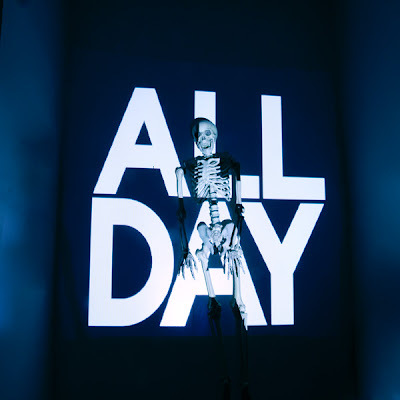 So 'All Day' is the latest example of cut-up to connect with the mainstream - produced by Girl Talk (aka Gregg Gillis) in Pittsburgh, it lays a vocal track primarily garnered from well-known hip-hop over a variety of musical bases - mostly from the nostalgia catalogue and ranging from The Ramones, Cream and Madness to Rage Against the Machine, Radiohead and, amazingly, Fugazi. It's entertaining and painstakingly done with the eleven tracks running together seamlessly to produce an hour long set. There's also the fun of identifying all the source material - and in case you can't be bothered or get annoyingly stumped, it's already been documented for you by a bunch of people with, collectively, too much time on their hands. Entertaining, but predictable is actually my personal take on 'All Day'. There is nothing surprising or outstanding in the mix and quite a bit of overlap with the work of 2 Many DJs' 'As Heard On Radio Soulwax' (Missy Elliott, Skee-Lo, Michael Jackson...). And where 2 Many DJs have the ability to thrill with uncommon choices, I find Girl Talk takes the easy way out almost always. ELO's 'Mister Blue Sky' made me smile on the Metro when it made its appearance and the use of the playout from 'Layla' is the best piece of music Eric Clapton never made; whilst closing the set, John Lennon's 'Imagine' makes an affecting though obvious choice. Overall though, it left me feeling impressed by the technique and underwhelmed by the creative vision - somewhat like eating a box of Quality Street. I am not particularly pro-Belgian but 2 Many DJs already do this kind of stuff and they do it better. Nonetheless this will be on my playlist for a while and I will return to it for the vicarious pleasure of seeing so many familiar tunes flash by at a dance-beat pace. STREAM: Girl Talk - "Oh No"
'All Day' is free to download at illegal-art.net but can also be downloaded in a seamless file from Soundcloud.